Jen and I have been talking for the past week about making meatloaf. We'd decided that it had been a long time since either of us had had meatloaf. Before tonight it had probably been at least ten years since I made meatloaf. So after chatting about it for a while we decided to make it. These are just some of the exciting conversations we engage in on a daily basis. To further the sadness of what excites us in our old age we planned it in advance. Tonight was going to be the night that meatloaf would be had! Unfortunately we both ended up having to work much later than expected and that meant a mad rush to do dinner. 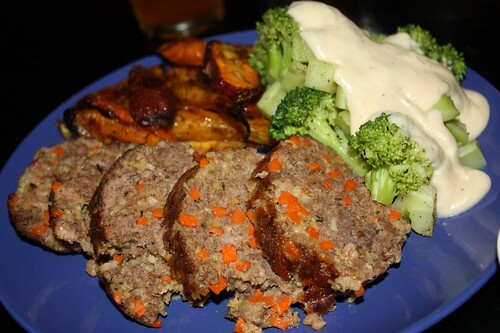 Meatloaf is not really the quickest thing one can hope to throw together in a pinch. As a result it probably wasn't seasoned as nicely as I'd have liked and I didn't have any time to allow it to cool before slicing which would have made for a less messy presentation. Luckily I'd done some of the prep work the day before so here's what went into the final mix. I cooked some garlic, onion, and carrot in rendered bacon then combined it with some ground beef. I added panko, salt, pepper, hot sauce, Worchestershire sauce, dried thyme, and two eggs. I worked it all together, rolled it up in some parchment paper, then baked it in the oven for about an hour at 375 degrees. It could have used a little more seasoning in retrospect but I was pressed for time. Besides, all the recent episodes of Iron Chef that I've watched have lead me to believe that no dinner can take more than one hour. I also tossed these fantastic rainbow carrots from Homestead Farm in Orange, Connecticut in a little olive oil, salt, and pepper and roasted them along with the meatloaf. Jen made some cheese sauce to go along with broccoli. Generally I think she uses butter, flour, milk, Worchestershire sauce, salt, and pepper in her sauce. Then she grated in some Grafton cheddar to finish it. To go along with our somewhat retro meal I served up this gourmet ketchup as a sauce. 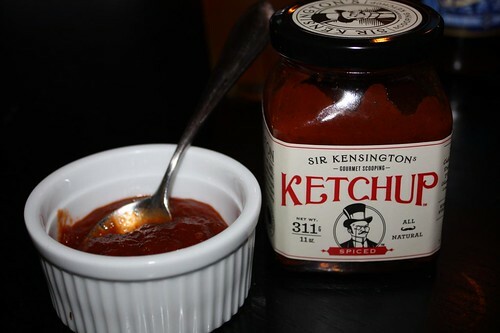 It's called Sir Kensington's Gourmet Scooping Ketchup. I'm a fan of any late 19th century gentleman with a twirly mustache, top hat and monocle. This was the spicy variety and was quite tasty. Oh, Sir Kensington, you had me at twirly mustache. As well as making a fine mustard Sir Kensington also has what I will venture to say is likely the most fun ketchup related websites on the Internet. The Facts About Sir Kensington section is the highlight in my opinion. It is reminiscent of the Most Interesting Man in the World but with a sometimes stranger take on that whole trope. 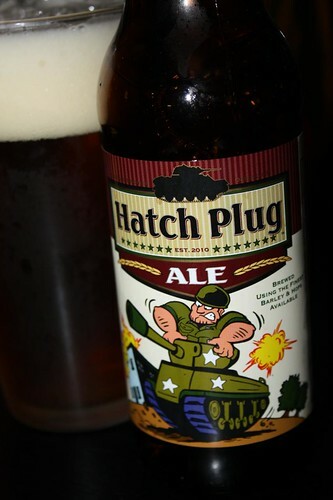 To wash this all down I enjoyed a Hatch Plug Ale from Cavalry Brewing in Oxford, Connecticut. It was an enjoyable beer and I'm generally a fan of any cartoony labeling particularly if it features an army guy in a tank. It's my second favorite type of labeling after a 19th century British guy with a monocle. I guess it is oddly fitting that I should enjoy this particular beer on Veterans Day. I think a new and more specific holiday may be in order for the future. That is why I propose a separate Tank Veterans Day. Just sayin'. I thought that was an odd name for a beer until I saw the label of the bottle which has the following text printed on it: "A happy tanker is a fat tanker and a real fat tanker is a Hatch Plug." I'm satisfied with that. That answers all my questions about the name of the beer without raising any additional ones.